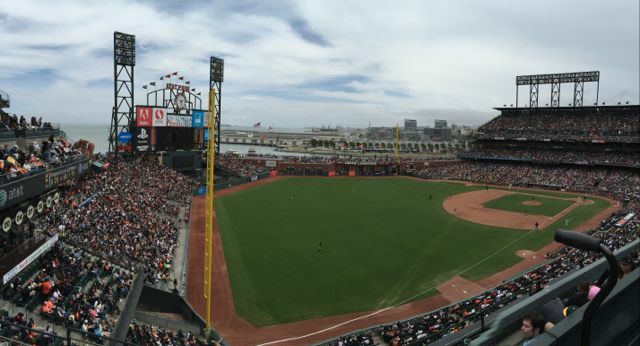 Many times here at Mobile Sports Report we’ve referred to AT&T Park as the “most connected” or “best connected” stadium in baseball, if not for all sports anywhere. But even after multiple network tours and numerous reports from stats given to us by Giants CIO Bill Schlough and his staff I realized that one thing I’ve never done is to roam around the park on a game day, checking to see if its renowned Wi-Fi and DAS networks perform as promised. 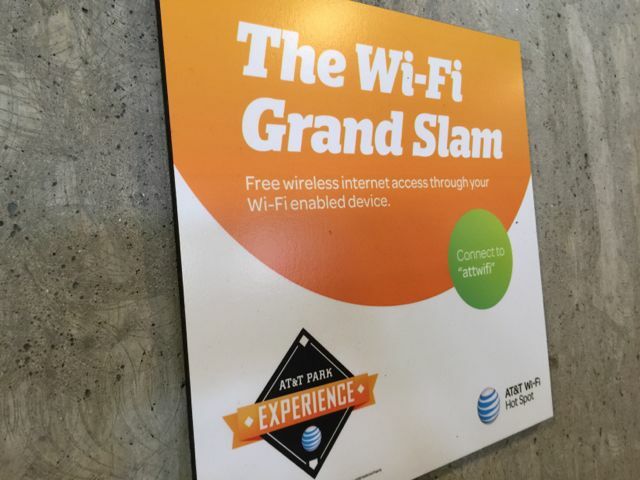 Now after attending a recent day game as the guest of AT&T, I can tell you that the stadium that first put in fan-facing Wi-Fi for every seat is still at the forefront of ballpark connectivity, with Wi-Fi and DAS performance that knocks the ball out of the park almost every time. I say “almost” because during my walkaround tour I was able to find one place in the park that had almost no connectivity at all — but I will also bet you that as soon as this story is published, Schlough and his team will likely be out there the next day installing some kind of coverage since he and they have an almost unmatched enthusiasm for making their fan-facing network the best it can be. That, plus a strong partnership with AT&T, gives fans at Giants games perhaps the best stadium network anywhere, with performance so good for so long that it has almost become somewhat of an afterthought, one of the best kind of compliments a network staff can receive. Dynasty is a word fans like to use around Third and King Street in San Francisco, especially after the Giants won their third World Series title in 5 years last fall. 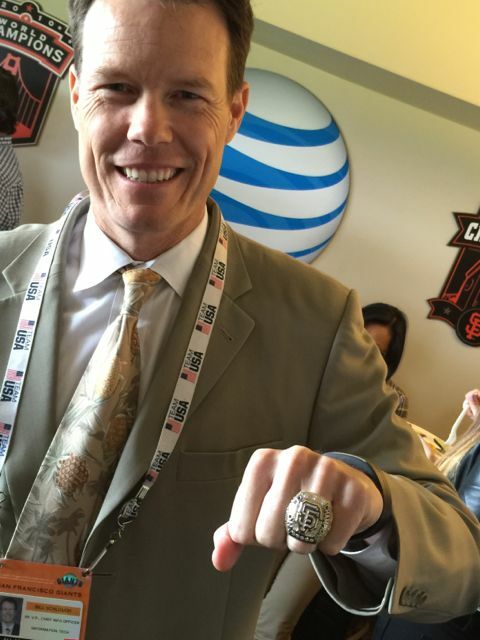 Schlough, who loves baseball and the Giants as much as he loves networks, used the press-day gathering to show off his most recent Series ring, a chunk of gold and diamonds that probably gives you a wrist-curl workout when you put it on. 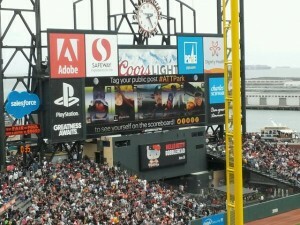 You might have heard some of the early Wi-Fi stories from AT&T Park before, but they’re fun to repeat. 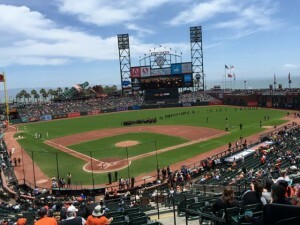 Then known as SBC Park, after the sponsoring “Baby Bell” that would later revive the family name of AT&T, the Wi-Fi network that debuted in 2004 attracted an average of about 94 fans a game, Schlough said, diehard geeks who would have to put up with people mocking them for bringing laptops to a ballgame. Remember, the iPhone was still 3 years away from existing, and you had to stick a PC card in a laptop to connect to Wi-Fi. Fast forward to 2015, and now for regular season games the Giants see an average of just more than 13,000 people connecting to the Wi-Fi network, a number that has basically leveled off over the past 3 years, Schlough said. What hasn’t leveled off, however, is data use — even from last season, when fans used an average of 591 gigabytes of data per game, so far this season they’re averaging 915 GB per game. 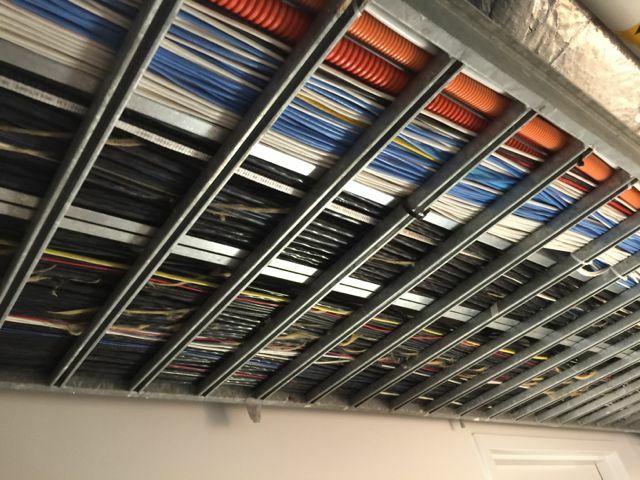 That’s why this season Schlough and team will be busy adding another 400+ Cisco Wi-Fi access points to the park, a total that should hit 1,700 by the time October rolls around. “We’ll be working hand in hand with AT&T trying to stay one step ahead of demand,” Schlough said. Scott Mair, AT&T’s senior vice president of technology, was on hand to help lead network tours before the game and to talk about how AT&T was using a new device called the EchoBOT to help gauge network performance in the park. 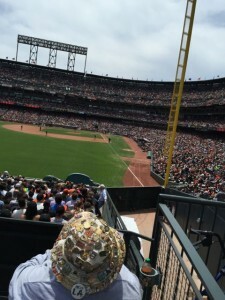 Though it’s a bit of inside baseball, EchoBOT — which is basically an off-the-shelf cell phone that sits in a ruggedized box — is the kind of thing that can come out of the smart-person pool at a technology giant like AT&T. Invented in-house, the EchoBOT basically gives network operators an on-the-spot way to determine not just how the network is working, but what the actual user experience is like from the end-user point of view. With 18 EchBOTs scattered throughout AT&T Park, Schlough and AT&T can get a much more granular view of how the stadium’s network is performing, just another way of using the resources of one of the world’s biggest telecom companies helps the fan experience at AT&T Park. So yeah, you can connect while you’re in line to get a hot dog. 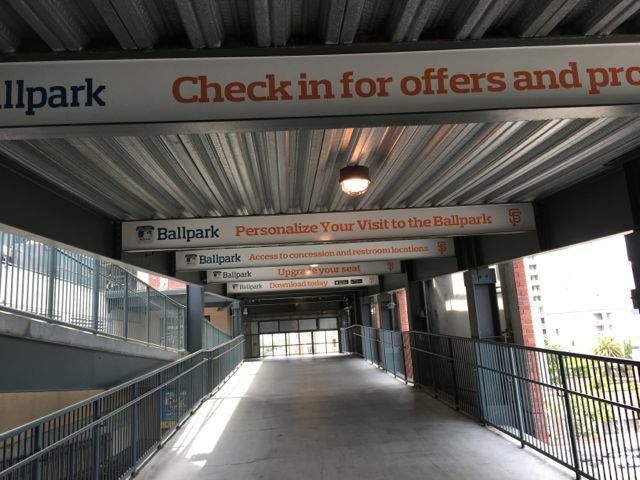 Strolling through the concourse toward right field, I saw several Wi-Fi advertisement signs, letting fans know they should definitely connect to the network. That’s a sign of deployment confidence, unlike many parks that install Wi-Fi but don’t really promote it, perhaps in order to keep user numbers down. After walking outside to get a view of McCovey Cove and the kayaks waiting for home-run balls to clear the park’s fences for a “splash landing,” I found a spot with almost zero connectivity — in the standing-room-only area backed up against the wall overlooking the bay. 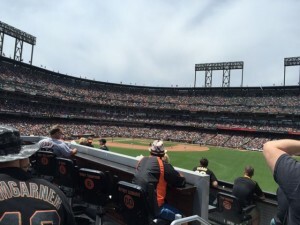 I kept wandering around the outfield concourse and found decent connectivity at the centerfield Coors Light bar, 9.32/17.31 for Wi-Fi on the Verizon device and 14.21/43.00 for Wi-Fi on the AT&T device, as well as outside the Giants’ social media cafe in left-center, 14.32/32.20 for Wi-Fi on the Verizon device and 13.61/34.70 for Wi-Fi on the AT&T phone. Unless you’re a Wi-Fi geek like me you probably won’t ever see the APs since they are painted to match the structures they’re attached to. 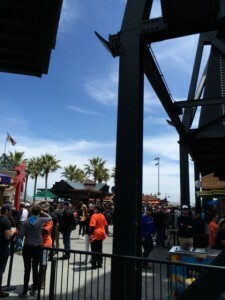 But I could see multiple APs hanging off the centerfield scoreboard structure, a piece of architecture that helps to deliver such solid connectivity to the open outside areas. You can see Wi-FI APs — if you know where to look. Taking a break in a standing area behind the left field foul pole I got a smoking result for Wi-Fi on the Verizon phone, 22.46 Mbps on the download side and an amazing 52.05 on the upload. 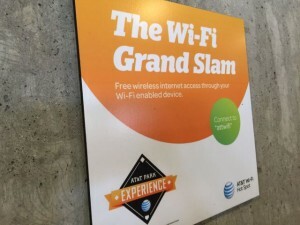 (I think it’s important to note that some of the best signals were on a device from an AT&T competitor, a sign that the facility does a great job of ensuring that any customer will get a good signal, no matter where you purchased your phone or service plan.) Climbing the stairwells to the view deck I still got a good signal on the concourse behind the seats in upper left field — 7.24/8.75 on the Verizon phone. Since it was getting windy and cold (summer in SF!) I ducked back inside and found an empty seat in section 332, near the upper left field corner of the park. There I got a Verizon Wi-Fi mark of 17.52/24.33, and a Verizon 4G LTE mark of 5.62/6.81, again showing that the AT&T Park DAS is also delivering solid performance for customers on other carriers. The AT&T phone at that location saw 12.46/18.79 on Wi-Fi and 12.68/17.06 on 4G LTE. 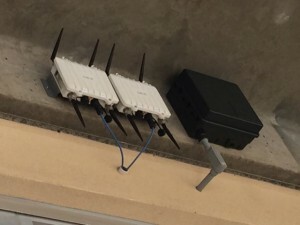 According to Schlough, the AT&T neutral-host DAS, which uses CommScope ION equipment, is so good that many fans don’t even bother to switch their phones to Wi-Fi. The upper deck, or view level, is scheduled to get many of the APs slated for installation this summer, in the under-the-seat enclosures that bring the network right into the seating areas. Here at MSR we get the question a lot — “what’s the park with the best network?” — and I would have to say that like its tenants, AT&T Park is tough to beat. 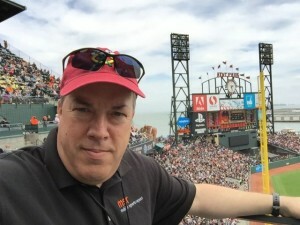 Schlough and the impressive IT team down at AT&T Stadium have a friendly rivalry, and you can’t have the most-connected discussion without mentioning Levi’s Stadium. But the park that did Wi-Fi first continues to improve year in and year out, never resting on its historic laurels. 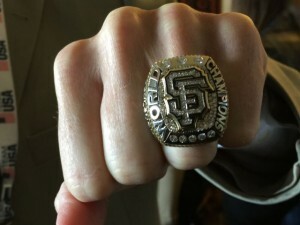 That’s a “dynasty” that is perhaps as impressive as the one built by the team on the field. 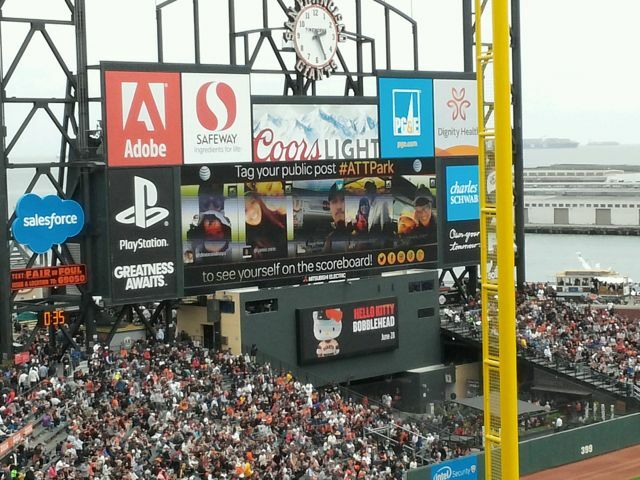 A little hard to see, but if you look closely you can see the Giants showing fan social media posts on the big screen. Good connectivity here in left field. Maybe the buttons on the hat improved reception? 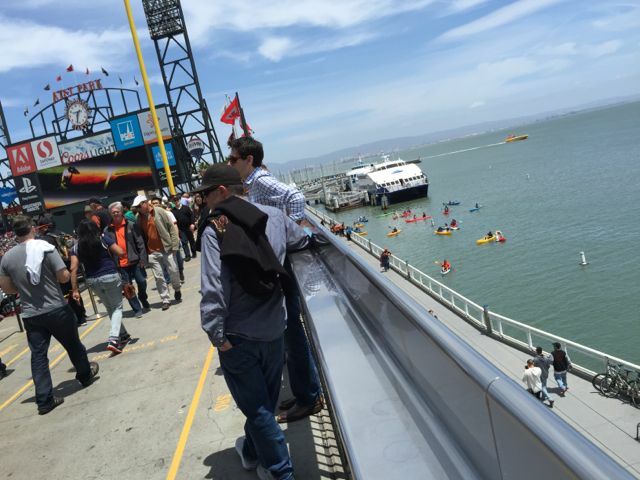 Nice place for a ballpark, don’t you think? MSR editor Paul Kapustka, your man on the Wi-Fi scene.